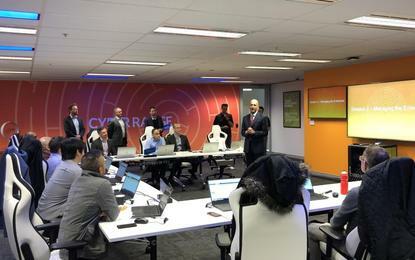 Cyber security vendor Palo Alto Networks has launched a Cyber Range facility in Sydney, the first one in the Asia Pacific region. Cyber Range is a dedicated training facility where IT and security teams from Asia Pacific can practice their skills using network simulations and cyber attack exercises. The space is part of the vendor's global initiative of the same name, Cyber Range. Its instructors simulate network functions and traffic to create a realistic network experience. Palo Alto Networks said Cyber Range gives participants timely training on the latest threats and most advanced real-world malware. Palo Alto Networks Cyber Range is free of charge, however the completion of the Ultimate Test Drive or regular experience with a next-generation firewall are recommended for Cyber Range Level I enrolment. Currently there are two available classes, the level I, which is a full day of training focused on network security best practices and level II, which gives participants a four-hour sneak peek at the vendor's conference Ignite 2018. To participate, an organisation need to have at least eight participants for a single team training and for multiple organisations participating at the same time one or more participants per company making a group of 12 people. "By combining different teams and personalities, the Cyber Range experience provides different perspectives and ideas that can help expand professionals’ understanding of cyber risks and ways to combat them using security best practices," the company said in a statement." The Sydney facility is the fourth Cyber Range, the other three are located in Amsterdam, Washington DC and Santa Clara. In March, Palo Alto Networks acquired US-based Evident.io in a deal worth US$300 million in cash. cloud security services and compliance automation provider Evident.io is expected to extend Palo Alto’s API-based security capabilities, helping cloud practitioners ensure their deployments are secure and achieve a continuous state of compliance, by analysing the configurations of all the services and account settings against strict security and compliance controls. A month later the cyber security vendor announced plans to acquire Israel-based cyber security player Secdo, in a bid to bring on new endpoint detection and response capabilities.